Bone cancer starts inside the bones. Find out who gets bone cancer, where it starts and how common it is. Primary bone cancer starts in the cells of the bones. This is different to secondary or metastatic bone cancer, which spreads to the bones from elsewhere in the body. If you have secondary bone cancer, this is not the right section for you. You need to look at the section for your type of primary cancer. This is named after the part of your body where your cancer started. The long bones of the arms and legs are supporting bones. The bones of the rib cage protect the organs of the chest. The skull bones protect the brain. The end of every long bone is covered with a smooth tissue called cartilage and lines the joints. Tendons hold the long bones together across the joints. The tendons and cartilage make joints that allow the bones to move smoothly against each other. Bone is a framework of soft supporting tissue called connective tissue. It also contains minerals such as calcium which hardens the bones. This framework gives the bone its strength. Throughout this framework are the bone cells. If a bone gets damaged, the osteoblasts make new bone to repair the damage. The osteoclasts break down any extra bone framework that the osteoblasts make and reshape the bone. When bone forms, osteoblasts are trapped within it and become part of the framework. They are then called osteocytes and maintain the bone structure. 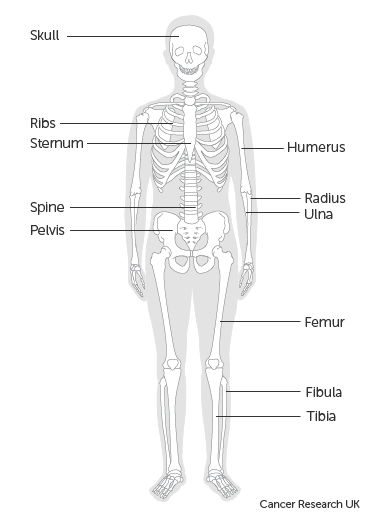 Inside some of the bones of the body is a space that is filled with bone marrow. Blood cells are made in the bone marrow. 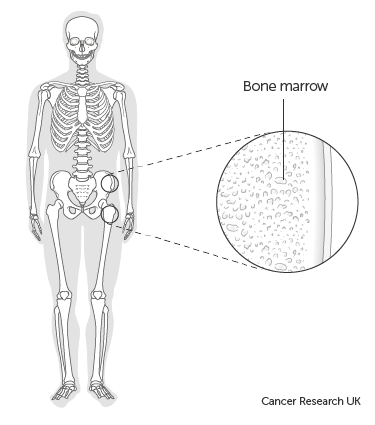 All blood cells develop from stem cells which are found in the bone marrow. There are several different types of primary bone cancer. Osteosarcoma is a type that is more common in the upper arms or legs. Ewing's sarcoma often starts in the pelvis, thigh or shin bones. A type of cancer called myeloma can affect the bones, and people sometimes call it bone cancer. It develops from cells in the bone marrow called plasma cells. But it is not a type of primary bone cancer because it does not start in the bone itself. So if you have myeloma your treatment will be different. When a primary bone cancer starts to grow, the cancer cells multiply and begin to break down the bone. This weakens the bone in that area. 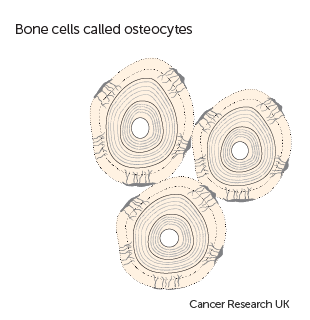 Bone cancer cells can break away from the primary bone tumour and travel to other organs, usually the lungs or other bones. There they can grow into secondary tumours. Bone sarcoma is linked to age. Unusually for cancer, it is more common in older children and teenagers. And it becomes more common again in older people. Less than 1 in 100 (1%) of bone sarcoma cases each year in the UK are linked to major lifestyle and other risk factors. Even in younger people bone sarcoma is extremely rare. In 2015, there were around 550 new cases of bone sarcoma in the UK. That’s around 2 cases diagnosed every day.